Just as important as any auction house strategy is the tools you use. I at one point was completely against using any addon what so ever. In fact all I had installed was Omen and Recount for raiding because it was mandatory (well not recount :P). And you guessed it, I was broke. So I'm basically going to cheat on todays blog and talk about the addons I personally use. First up it's the addon we all know and love. Auctioneer Suite is a powerful addon for any auctioneer whether your just an average farmer or trying to manipulate markets and take over your auction house. One of my personal favorite addons is Auctionator. This addon works similar to Auctioneer but is alot easier on your resources and alot simpler to use. There are 3 main features about this addon that I really like which are the new Buy and Sell tabs and the ability to check all your auctions to see if any are undercut. To the right is a picture of the sell tab in which I blatently stole from curse so I didnt have to log in and take one myself lol. You will notice a yellow highlight on the prices. That's where you can select the pricing you want your stuff to undercut and post at. Posting is really similar to auctioneer's posting of breaking up the stacks automatically and posting for you. The buy feature is extremely convenient for buying things. The same kind of list appears and when you go to buy something off that tab a window pops up asking how much of the item at the price you want to buy. You enter in say 6 for 6 stacks and click buy and viola all 6 stacks are purchased instantly. The next addon is of course Quick Auctions2. I know every blogger has a blog about QA but its such a powerful tool theres a reason why its mentioned so much. It's only really useful if you carpet bomb glyphs or gems. The reason I didn't crop this picture was because it's my only picture I had of QA and it just so happens the tool from yesterday's blog was nerd raging on me yet again lol so I figured I'd humor you guys with a good laugh. I had originally given a brief walkthrough of QA2 until I realized it was nothing compared to what Belsebub, author of The Happy Scribe, had written up. So check out this great guide written by Belse. That pretty much wraps it up for the AH based addons now to talk about some of the support addons I use. For your profession window you generally have 2 common addons. ATSW and Skillet. I have both and I use both depending on the situation but I lean towards ATSW as my favorite based on sheer looks. ATSW is pretty much the default tradeskill window modified slightly but is easy to use and really quick to get used to. Skillet on the other hand completely reworks the window into its own window and takes alot longer to get used to. Both are great addons depending on your personal taste and both pretty much do the exact same thing. It just boils down to preferences on the look you want. The key features to both of these great addons is the ability to create a queue for making your items. You add it into the que and click process and it'll make the things in order. If you queue up say a frostweave bag it will add a bolt of frostweave and a bolt of imbued frostweave before the bag simply by just adding a frostweave bag to the queue. The second important feature is the ability to automatically purchase reagents from the vendor. Great if your a scribe. Have a bunch of Ink of the Sea on you and head to the ink trader with everything in queue. Click buy reagents at the top of the merchant window and viola it automatically converts your ink of the sea into all the inks needed to make whats in your queue. Last but not least we have Altoholic. This is another godsend addon especially for those of us who have banker alts to do our dirty work. This addon will tell you who has what on the tooltip of the item. You can even bring up the altoholic window and browse other character's banks and even your banker's guild bank. A definate must have. Well, I thought today's post was going to be short and sweet but what can I say? There's a ton of great addons out there. And using them definitely gives you an advantage over your competition if their not using them. 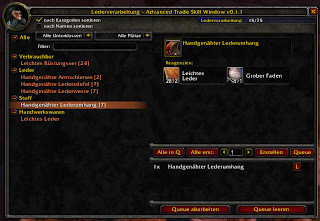 Nice post, even though I have most of these addons I find auctionator pretty interesting. What are the main diferences between it and auctioneer? Yea I figured most of us had the addons but *shrugs* lol. I will definently take a look at it. Does it work together with auctioneer? Yes it does :) I was using both for months without any errors. One little thing in this list is missing... Lil'Sparky's Workshop, which is a must if you are crafting anything from Netherweave Bags to Glyphs to anything relevant. Ok, maybe not a must, but it's a definite time saver in the planning.